Fruit pies are one of my favourite desserts and go very nicely with a cup of tea. 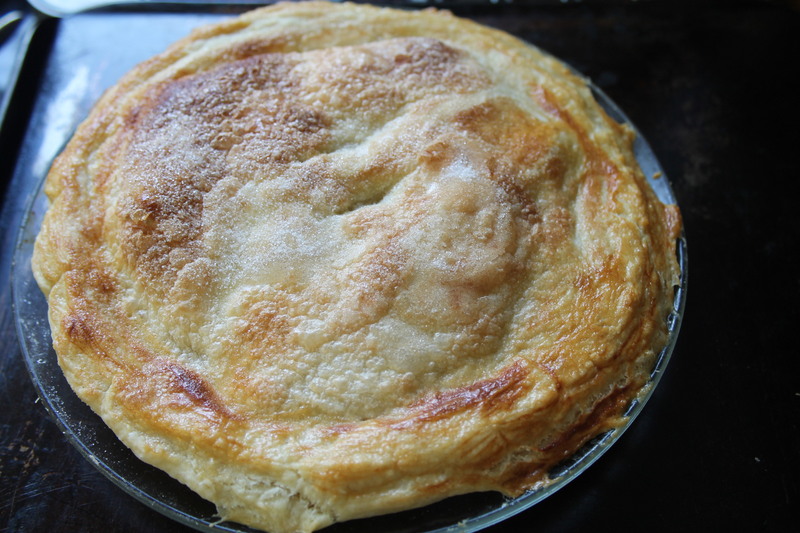 I made an apple pie yesterday but you can use any fruit you like, be it tinned or fresh. If you are using fresh fruit then you may need to sweeten and cook the fruit first. If using tinned, the fruit is very often not only sweetened for you but also partly cooked. You can use shortcrust or rough puff pastry for fruit pies and you can make it yourself or buy it already made. If you are using frozen ready-made pastry remember to take it out of the freezer well before you start, or if using chilled then take it out about 30 mins before. So cut the pastry in half, roll out one half, lay that on a pie plate, add the tinned or fresh fruit, roll out the other half and use to cover the fruit, having wet the edges of the pastry before squeezing them together. Brush with beaten egg and sprinkle with caster sugar and bake for 20 mins in a hot oven until golden brown and serve with fresh cream or custard. approx 4 fluid ounces of very cold water to mix. Sift the flour into a bowl with the salt, cut the butter into small pieces and add to the bowl, using a knife only stir together (do not rub in) and then mix to a stiff dough with the water. Roll the pastry out on a floured board to a rectangle then fold into three and turn a quarter turn so an open end is facing you. Roll out again to a rectangle. Do this folding and rolling and turning a nother three times making sure you roll away from you each time. This puts plenty of air into your pastry. Wrap the pastry in cling film and refrigerate for 20 mins. Meanwhile prepare your fruit by peeling and coring the apples, slice or dice and cook for 2 mins in the microwave or on the hob. Add sugar to taste. Choose a suitable pie plate and roll out half of your rough puff pastry to fit, sprinkle the base with a little flour and then put your apples in. Roll out the remaining pastry to fit over the apples and dampen the edges of the base with some water, lay on the top crust and mould to fit around your fruit. Using a knife knock up the two edges of your pastry and then make little cuts from the edges towards the middle of the pie on this crust. Cut some air vents in the top or use a fork to prick the whole top of the pie, brush with beaten egg or milk and then sprinkle with caster sugar. Bake in a very hot oven, 230C, 450F or gas mark 8 for 10-15 mins and then reduce the temperature to 190C, 375F or gas mark 5 for another 10 mins until golden brown. Serve either hot from the oven or leave to cool with cream or hot custard. There you have it, either the easy way or the hard way I am sure your pie will taste delicious! Editor’s note: to counterbalance the sweet in this treat, we recommend a plain, hearty black tea to partner.